How awesome would it be to create a spa experience in your own bathroom? After a grueling day at work or wrestling with the kids, wouldn’t you like to relax in a cozy tub or wash away the day in a refreshing shower? At Plumbtile, we strive to offer you that exact experience with the highest quality from top name brands. Here are the 5 best ways to create a spa experience direct from us to you! Large, oversized shower heads are a huge trend today, and not only for their looks and fantastic function. These provide full–body coverage over clean water in fact, many of them, such as Hansgrohe shower heads, use less water than the smaller, traditional models. You can relax easily and guilt-free knowing that you are not harming the environment to do so. 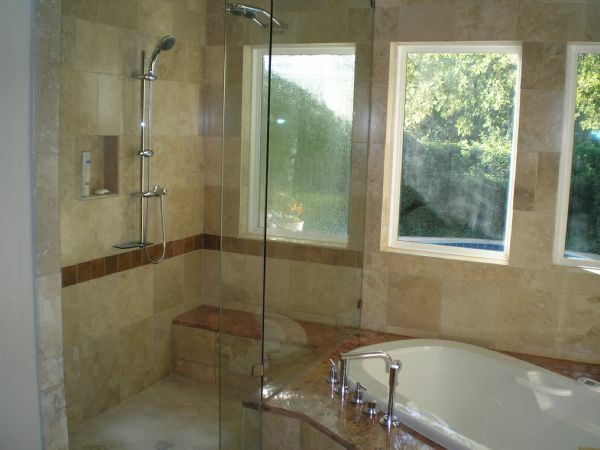 You will come out of one of these showers feeling rejuvenated after a tough day’s work – or invigorated to start one. For a longer period of relaxing, soaking tubs provide a very unique experience. These are slightly different than your grandmother’s tub, and do wonders to melt away your cares and worries quickly. The designs are almost always edgy and contemporary, but still flawlessly fit into almost any décor or bathroom design. Stone Forest is one of the leading producers of luxurious tubs and sinks. They come in many shapes and sizes, and they will even customize one to suit your specific taste through the use of natural materials such as bronze, copper, and especially stone. As a bonus, they offer matching vanities, sinks, and pedestals. Lighting is so essential in creating the right environment for the full spa experience. Too much light will ruin the entire experience, but you also need more light during other times of the day, so the real trick is placement. In areas where more light is needed, such as around the vanity, don’t shy away from using what you need. To switch from this to lower lighting, use recessed or even underwater lights that are less bright and create more of an ambient glow than a harsh glare. It’s no secret that here at Plumbtile we just LOVE pebble tile. Not only is it easy to use, but it creates a wonderful and authentic feel to any patio, bathroom, or even kitchen. There are, however, plenty of other options for natural stone tile. If you are not a fan of pebble tile, or simply need something to compliment its use, try options like the Mandala Tile Etrusco Collection to create a neutral, yet pleasing and forward thinking design. You don’t need to have a large budget to implement just one or two indulgent elements to your bathroom. Something as simple as upgrading your shower head can do wonders. For more ideas, inspiration, and clearance items, feel free to stop by the Plumbtile site. Do you have an item or design element that makes your bathroom a sanctuary of relaxation? Share it with us by commenting below!